So the village where I grew up, and where my parents still live is having problems due to the rain. No worries, my parents house is in no danger at the moment. The Harvey Jones Canal, one of the main flood canal's in Corrales is blocked right now by 8 feet of dirt / mud where Corrales Road crosses the Harvey Jones Canal. So they spent most of the day and the evening ripping out the walls of the bridge on Corrales Road so that the water can flow over the road, and get to the Rio Grande. This was all over the 10 o'clock news, and as such I have video of it. I must say the video is rather impressive and worth checking out. The normal "if you don't have high speed internet, this might take awhile" applies. Now due to the fact that water is now flowing over Corrales road, Corrales Road is closed from Camino Todo los Santos to Paseo Cesar Chavez for an undetermined period of time. 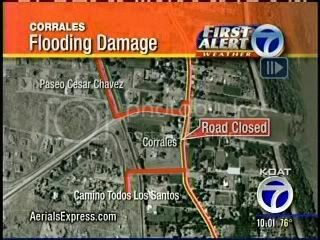 I must say that this is very wild in that Corrales road is the only major North - South crossing in Corrales over the Harvey Jones Canal, and now its closed and when it will reopen in unknown. I must say rush hour traffic is going to become real fun here come the morning. Right now, I just hope everyone is safe, and remains that way.